The itineraries and tours listed below are samples. Locally registered guide associations, as well as Addis based tourism companies, can organize tours tailored to meet your interest, needs and time. Arrangements can be made with locally registered and approved guides associations. You are free to decide whether to travel on foot or horseback. However, it is recommended to take a packhorse. No prior riding experience is required. The mountain campsites are set between 17km and 22km apart at between 3,000m and 4,100m altitude. Walking or riding from one camp to the next takes 6-8 hours, allowing you to spend each night at a different site. Each campsite has its own distinctive features and spectacular views. Explore all habitats of the Bale Mountains National Park as you trek across the home of the Ethiopian wolf, mountain nyala, giant molerat and Bale monkey. Experience stunning Afroalpine mountains and natural scenery while heading deep into the heart of the Sanetti plateau – a floating land. Explore vast moorland and discover Afroalpine plants as you camp in the wilderness. Hike amongst rock pinnacles etched out of the lava flows by millions of years of ice and winds, and pass waterfalls and alpine lakes. Camping in the Harenna forest may reward you with a sighting of the elusive animals that live there. Wildlife that can be seen along the way includes the olive baboon, warthog, rock hyrax, Starck’s hare, klipspringer, grey duiker, African wild dog, giant forest hog, leopard, lion and birds of prey. There are numerous trekking routes throughout the park, varying from two to eleven days. A day of trekking consists of anywhere from three to eight hours of hiking. Treks range from 3,000m to above 4,000m altitude. This itinerary takes you from the Bale Mountains National Park headquarters at Dinsho, through the Gaysay grasslands over the Sanetti plateau and into Harenna forest. Web Valley Drive: The road through the Web valley starts at the park headquarters. It is signposted near the base of the hill where the lodge is located. It is a rough dirt track, easily navigable with a 4WD vehicle during the dry season, but impassable after heavy rains (ask locally). The first 8km or so pass through farmland along the edge of the park. Local people are generally friendly. You then enter the park, and settlements and crops begin to thin out. From May through July, vast fields of red-hot pokers glow amongst the lush green background with their distinctive red and yellow flowers. 12km beyond the headquarters, the road travels parallel to the Web River, skirting an impressive gorge where rock hyraxes are often seen. Leopards, black eagles and giant eagle owls are occasionally seen along the edges of this gorge as well. At the top of the gorge the road crosses a stone bridge over the river, and then rises steeply. At the top of the rise, 200m further along, you will again cross the Web River. Here, the road enters the Afroalpine habitat, and it is here that the Bale landscape magnificently presents itself. This is also where one begins to look for Ethiopian wolves and hunting raptors. 50m after crossing the Web River again you will see the Finch Habera waterfall (“woman’s urine” in local language!) – an excellent place to stop for a picnic or camp overnight. The Web valley road continues across the open Afroalpine plain and ends 18km after leaving the headquarters. Gaysay Grasslands: Turn left from the park headquarters and drive 7km to the Gaysay grasslands. You are likely to see warthogs and the endemic mountain nyala from the road, and a short walk through the waist-high grasses and wildflowers will give you a chance to spot the endemic Menelik’s bushbuck, grey duiker, bohor reedbuck, and many others. Back in the vehicle, take the dirt road on your right at the disused ticket station and continue for one kilometer, until you reach the guardhouses, just before crossing the Gaysay river, where you can park. It is possible to approach within a few meters of the mountain nyala (as well as many other mammals). Further exploration will take you to the woodlands where elusive animals such as the serval, spotted hyena and golden (common) jackal reside – the latter is commonly heard calling in early evening. Make sure to also listen for the finest songbird in Africa – the Abyssinian catbird. Before returning to your car, follow the trail to the Web River waterfall, easily reached by foot in under an hour from the main road. Finally, return to the headquarters or continue on to Goba or Robe. Sanetti Plateau to the Harenna Forest: Early the following morning, head to the Sanetti plateau. 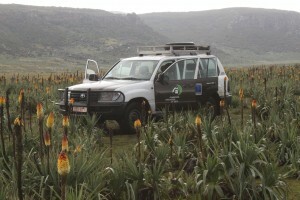 From the park headquarters, turn right and follow the main road through Goba and Robe to the plateau. As the sun rises, the most endangered canid in the world – the Ethiopian wolf – begins to hunt. The Sanetti plateau is the best place in Ethiopia to see this elegant animal, and the winding road atop the plateau, one of the highest all-weather roads in Africa, is an ideal spot for viewings. The plateau is crawling with rodents, the largest being the giant molerat, found only in the Bale Mountains. Explore the area on foot, marveling at the lichen-clad rocks, indicators of pure air. Look to the sky for soaring birds of prey: golden, tawny and Verreaux’s eagles as well as the bearded vulture (lammergeyer), lanner falcon, and augur buzzard. Continuing again by car, you will pass Tulu Dimtu or “the Red Mountain” just 4km off the main road. This is the second highest mountain in Ethiopia at 4,377m. The summit is reachable by car or by foot in under an hour. As you reach the end of the plateau, you enter the Harenna escarpment, plunging more than 2,000m towards a vast tropical forest in just 8km. Driving down switchback roads, you’ll be treated to magnificent views. After passing through stands of giant heather the road takes you to the small village of Rira. Stop for lunch and enjoy the local dish of ambesha and gomen (flatbread and steamed kale) at one of the two restaurants (see directory for more information). Found at the base of the Harenna escarpment, Rira is the center for a bamboo forest walk and short waterfall hike into the stunning Harenna forest. See here for further details. Additionally, at the right time of year, you can help the locals harvest honey. Continue on the same road from Rira and drive towards Delo- Mena. You can camp at a designated camping ground or stay at the Bale Mountain Lodge (by far the nicest lodging in the Bale area). There is a gravel turnoff 7km from Rira that is clearly signposted on your left for the lodge. Otherwise, spend the evening at the Harenna Forest Hotel and Cultural Lodge in Rira. Alternatively you can drive 50km south to Delo- Mena, which is known for its coffee and offers basic accommodation, or return to Goba, Robe or Dinsho for the night. Harenna Forest: Hike the Gushuralle Peak Forest Trail (see here for details) which leads to the apex of the Gushuralle Mountain, rendering panoramic views of primary forest through dense stands of mountain bamboo. With some luck, you may encounter the elusive bamboo specialist endemic to the Bale Mountains: the Bale monkey. Located within this forest is the wild forest coffee village of Manyete, where you can learn the traditional ways of harvesting coffee. Spend the night camping or at the Bale Mountain Lodge, and in the morning drive to Goba, Robe, Dinsho or Delo-Mena to the south. If you pass through the plateau during early morning or late evening, you may encounter Ethiopian wolves as they gather for social occasions and patrol their territory before they retire to sleep. Additionally, an early morning drive south towards Delo-Mena is an ideal time to spot lions on the road. 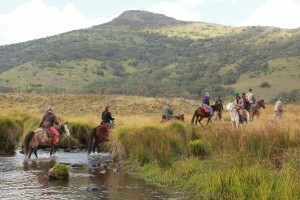 There are many other activities to do within the Bale Mountains National Park during your visit. These include day hikes to waterfalls and mountain peaks, and activities such as fishing or harvesting forest coffee. You can find the full list here.